For Jason's "original" name of Diomedes, see here. JASON, in Greek legend, son of Aeson, king of Iolcus in Thessaly. He was the leader of the Argonautic expedition. After he returned from it he lived at Corinth with his wife Medea for many years. At last he put away Medea, in order to marry Glauce (or Creusa), daughter of the Corinthian king Creon. To avenge herself, Medea presented the new bride with a robe and head-dress, by whose magic properties the wearer was burnt to death, and slew her children by Jason with her own hand. A later story represents Jason as reconciled to Medea (Justin, xlii. 2). His death was said to have been due to suicide through grief, caused by Medea's vengeance (Diod. Sic. iv. 55); or he was crushed by the fall of the poop of the ship "Argo," under which, on the advice of Medea, he had laid himself down to sleep (argument of Euripides' Medea). The name (more correctly Iason) means "healer," and Jason is possibly a local hero of Iolcus to whom healing powers were attributed. The ancients regarded him as the oldest navigator, and the patron of navigation. By the moderns he has been variously explained as a solar deity; a god of summer; a god of storm; a god of rain, who carries off the rain-giving cloud (the golden fleece) to refresh the earth after a long period of drought. Some regard the legend as a chthonian myth, Aea (Colchis) being the under-world in the Aeolic religious system from which Jason liberates himself and his betrothed; others, in view of certain resemblances between the story of Jason and that of Cadmus (the ploughing of the field, the sowing of the dragon's teeth, the fight with the Sparti, who are finally set fighting with one another by a stone hurled into their midst), associate both with Demeter the corn-goddess, and refer certain episodes to practices in use at country festivals, e.g. the stone throwing, which [...] was probably intended to secure a good harvest by driving away the evil spirits of unfruitfulness. Les fais et processes du noble et vaillant chevalier Jason was composed in the middle of the 15th century by Raoul Lefevre on the basis of Benoit's Roman de Troie, and presented to Philip of Burgundy, founder of the order of the Golden Fleece. The manners and sentiments of the 15th century are made to harmonize with the classical legends after the fashion of the Italian pre-Raphaelite painters, who equipped Jewish warriors with knightly lance and armour. The story is well told; the digressions are few; and there are many touches of domestic life and natural sympathy. The first edition is believed to have been printed at Bruges in 1474. Caxton translated the book under the title of A Boke of the hoole Lyf of Jason, at the command of the duchess of Burgundy. A Flemish translation appeared at Haarlem in 1495. The Benedictine Bernard de Montfaucon (1655-1741) refers to a MS. by Guido delle Colonne, Historia Medeae et Jasonis (unpublished). The Histoire de la Toison d'Or (Paris, 1516) by Guillaume Fillastre (1400-1473), written about 1440-1450, is an historical compilation dealing with the exploits of the tres chretiennes maisons of France, Burgundy and Flanders. The hero of this renowned expedition was Jason (or Iason), son of Aeson, rightful king of Iolcus. Aeolus, son of Hellen (see Hellen), died, leaving the kingdom of Iolcus to his son Aeson. Pelias, his step-brother, drove ^Eson from the throne and ascended it. An oracle had bid Pelias "beware of a man with a single sandal." A grave cause of alarm soon appeared in the form of Jason. Jason determined to reclaim the throne to which he was heir. On his way to Iolcus he found the river Enipeus much swollen. Hera appeared in the form of an aged woman and bore him across, but he lost one of his sandals in the stream. Pelias recognized Jason as soon as he arrived at Iolcus, but he was unwilling to resign the throne, and in order to prevent Jason from demanding his right Pelias sent him to fetch the Golden Fleece from Colchis. Jason consented to undertake the expedition. Athena and Hera assisted him to build the great ship Argo, and when it was finished Jason gave a general invitation to the heroes of Greece to join him in his enterprise. Prominent among those who came were Admetus, Boreas, Castor and Pollux, Heracles, Calais, Meleager, Neleus, Orpheus, Peleus, Pirithous, Theseus, and Zetes. Amathas, uncle of Jason, married Nephele, and their two children were Helle and Phryxus. Nephele died, and Amathas married Ino, and their sons were Learchus and Melicertes. Ino, conceiving a hatred for her stepchildren, tried to destroy them, but the shade of their mother came to their aid by bringing a large ram with a golden fleece, on which they were to make their escape by the sea. They started on their journey, but Helle fell into the sea and was drowned; so the sea was called Hellespont. Phryxus passed over in safety to the opposite shore. He then went to Colchis, and sacrificed to Zeus the ram that had carried him in safety, and he hung its golden fleece in the temple of Ares. When everything was in readiness Jason sacrificed to Zeus, and as a sign of his favor Zeus answered by thunder. The Argo went first to Lemnos, where it remained for a long time. Here Jason married Hypsipyle, and she bore a son whom she called Euneus. The Argonauts left Lemnos and passed on to Cyzicus. Here occurred the loss of Hylas, the search for him by Heracles (see Heracles), and the loss of the ship of the latter. They then went to Scutari, where occurred the contest with, and victory over, Amycus by Pollux. They now passed toward the entrance of the Black Sea, and found the unfortunate Phineils, who was so tormented by the Harpies (see Phineus). They freed him from those dreadful creatures, and in return he gave them wise directions by which they passed in safety through the Symplegades, two great cliffs that had the power of moving together and crushing anything that attempted fo pass between them. Phineus advised them to let a pigeon fly between the cliffs, then follow in the wake of the bird; they did this, and passed in safety to Colchis. The king of Colchis, Aeetes, was a son of Helios. He refused to yield the Golden Fleece to the Argonauts unless they would undertake certain hazardous enterprises. The Golden Fleece was suspended from an oak tree in the temple of Ares. 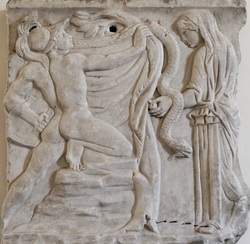 It could be obtained only by the following heroic deeds: Aeetes owned some bulls that emitted flames from their nostrils, and had brazen feet; he who aspired to the honor of taking the fleece from the oak tree must plough the Field of Ares with these terrible creatures, and must then sow the field with dragons' teeth, from which armed men must spring. 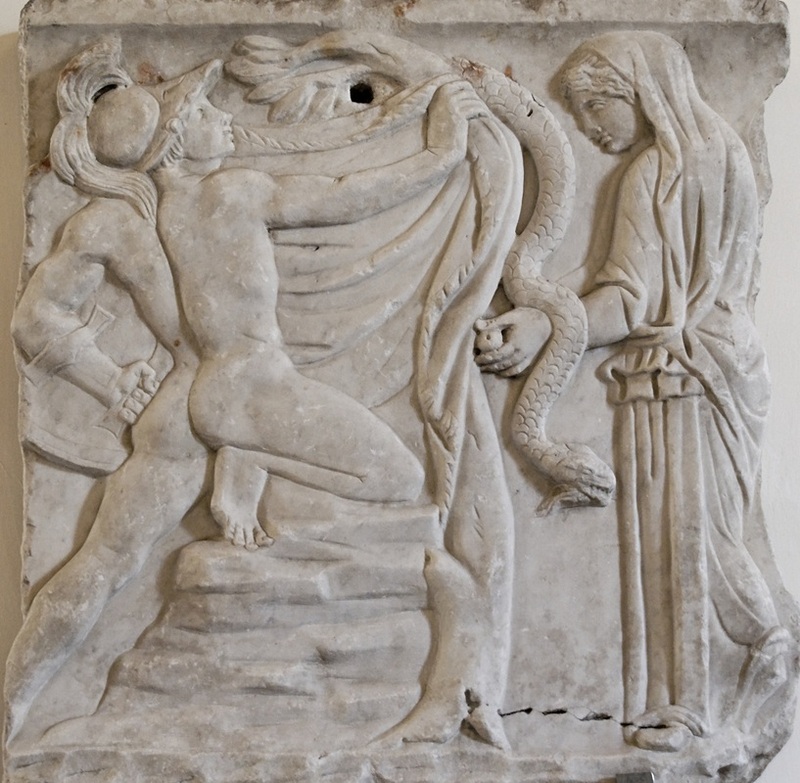 Medea, the daughter of King Aeetes, was a sorceress, and, having conceived for Jason a violent love, she assisted in the capture of the fleece by furnishing him with a magic mixture which rendered him proof against fire or sword. Jason procured the Golden Fleece, and, taking Medea and her brother Absyrtus with them, the Argonauts started on their homeward journey. King Aeetes soon missed his daughter, and started in pursuit. He was about to overtake them when Medea used this terrible stratagem to divert his attention: she took her brother Absyrtus, divided him in pieces and threw them into the sea. Medea and Jason thus escaped. After other adventures the Argonauts reached Iolcus, and consecrated their ship to Poseidon in the grove sacred to him. Jason now presented the long-sought Golden Fleece to Pelias and demanded his throne. Pelias refused to yield it; so Jason slew him and became king of Iolcus and also of Corinth. Jason now formed a strong attachment for Creusa, daughter of Creon, king of Corinth. Medea, infuriated with jealousy, sent to her rival a poisoned robe and wreath, and thus caused the death of Creusa. She then murdered her own two children, and in consequence fled to Athens, where she lived with King Aegeus. She here made an attempt on the life of Theseus, and was obliged to flee. It is said that she returned to Colchis. Jason's death was caused in this manner: in great depression of spirits Jason sought relief in the sacred grove of Poseidon, in which had been consecrated the Argo. As he passed near the ship a portion of it fell upon him and caused his death. Photo credit: (above) © Marie-Lan Nguyen / Wikimedia Commons; (below) Wikimedia Commons. Jason arrives in Colchis with one sandal. 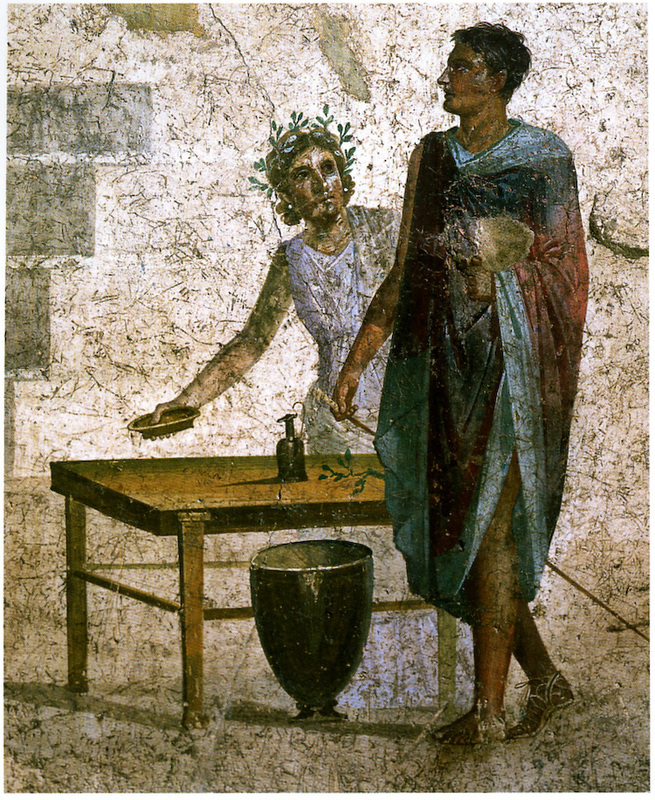 Roman fresco.